PLEASE PRINT THIS BEFORE YOU ARRIVE. There are not copies on site. ARRIVAL – Festival day does not begin until 10am, however we do ask that you are in the building between (9:30 and 9:50) as the formal ceremony starts promptly at 10 am. Thank you for your cooperation. STUDENT PRESENTERS/SIGN CARRIERS – If you have presenters or sign carriers that have been selected to participate in the ceremonies, please make sure they check in 20 minutes before the ceremony at the back of the Agriplex building (where workshops will be). Please look for the large yellow signs. Volunteers will check them in and they will receive their badge and meet with their nominee. Immediately after the ceremony the readers can be picked up at the stage. PLEASE ENSURE SOMEONE IS THERE TO PICK THEM UP AFTER THE CEREMONY. FOOD ONSITE – Readers are encouraged to bring a lunch. However, the cafeteria will be open in the Agriplex Building. Choices include chicken fingers, fries, pizza, hot dogs, confectionary snacks and some grab and go items. Items can be purchased individually or as part of a combo. Prices vary from approximately $4 to $8. WRISTBANDS – The wristbands will be mailed in mid-April. Please make sure that all readers AND chaperones have their wristbands before they arrive onsite. All people entering the site must have a wristband. IMPORTANT: Please note that the CHAPERONE’S CELL PHONE NUMBER MUST BE WRITTEN ON EACH READER’S WRISTBAND. Please have the number written on the outside of the wristband. Readers WILL NOT be permitted into any event without these wristbands. Wristbands will not be mailed until payment is received. PENCILS/PAPER FOR WORKSHOPS – Some of the activities may require that readers have pencils and paper to participate. Please encourage your readers to come prepared. All workshops that require pencils and paper will mention it in the description. BAGS/KNAPSACKS – There will be activities for kids to participate in and items that may be given away throughout the day. We encourage participants to have a bag to carry any free books/promotional swag they receive. If possible, please label each reader’s bag with their name and school/library. BUSES – Please ensure that every chaperone is aware of their bus number AND their bus driver’s cell phone. We are asking that buses pull up in front the Agriplex building in an orderly fashion and only when the entire group is ready to board the bus. Once the full group is together please call the bus driver to pull up. ONSITE STORE – Just a reminder the nominated books and Forest/I READ CANADIAN products will be for sale onsite at the Festival. Price lists are on the Festival website so that attendees are aware of the prices before they arrive and can bring the correct amount of money. INFORMATION/LOST and FOUND – If one of your readers happens to get separated from the group, please make sure they are aware of where to find the OPERATIONS TABLE. It will be located in the lobby of the Agriplex. There will be an Festival staff member there at all times wearing a red vest. If your reader loses his/her group we will be able to contact you by the cell phone number that is written on their wristband. This is also where the Lost and Found will be. Please note that the OLA, Western Fair District, the London Public Library and its volunteers/staff are not responsible for lost or stolen items. AUTOGRAPHING – Nominees will be autographing books and the official Festival of Trees Autograph Pamphlet only. Please note: YOU MUST PRINT OFF THE PAMPHLET BEFORE COMING TO THE FESTIVAL. Please abide by this request. Please make sure that your readers are aware nominees will only sign their books and this pamphlet and that they are not asking authors to sign anything but one of these two items. This is to ensure that we use the time the authors are signing most effectively. MAP OF THE EVENT – Download the London Festival Venue Map or access the map on the mobile app, so you are familiar of where things will be happening. MEETING SPOT – We encourage chaperones to plan out a “meeting spot” or a way of making sure readers can reconvene periodically throughout the day. School uniforms, specific t-shirt colours, or even something that can be held in the air for readers to see you can sometimes be helpful. PROGRAMS & WORKSHOPS – All workshops will take place in the Agriplex Building. There will be volunteers stationed around the venue to help readers to find their way. The authors will be entertaining the students in an informal setting and speaking to a crowd that is seated. Please talk to your readers before, or en route, to find out exactly what they are interested in. The events are all “free-flowing,” but please encourage your readers to stay at the sessions once they have chosen one. If they wish to move, please make sure they do so VERY quietly and do not disrupt the person leading the program or the other participants. NOTE ABOUT WORKSHOPS: Workshops at the Festival is a wonderful experience for all of those attending. Please be mindful of the fact there is limited space and seating will happen on a first come first served basis. SOCIAL MEDIA – We encourage you to share these photos and the highlights from the Festival via Facebook and Twitter. EMERGENCIES – If for some reason you need a number to contact on the day of the event, or if the school/library needs a contact number, they can contact Meredith Tutching at 416-917-8355. This number is ONLY for emergencies. Agriplex emergency exit map. PARKING – Please ensure that all visitors, parents and volunteers park in the Public parking lot on the grounds. MOBILE APP – AVAILABLE APRIL 26: Download the EventMobi app through the Apple App Store or Google Play Store. 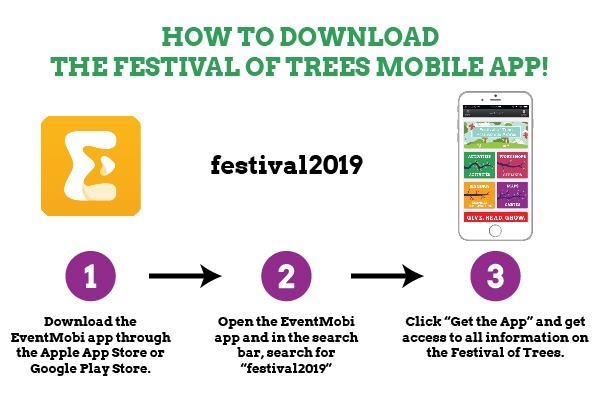 Open the EventMobi app and in the search bar, search for “festival2019”. Click on “Get the App” and get access to all information on the Festival of Trees.